Fifty years ago, Andy Warhol rocked the art world and the world of popular culture with his depiction of Campbell’s soup cans at the Los Angeles Museum of Contemporary Art. This year, Campbell’s returned the favor, with a collectors edition of 1.2 million cans of tomato soup that went on sale at Target on September 2. 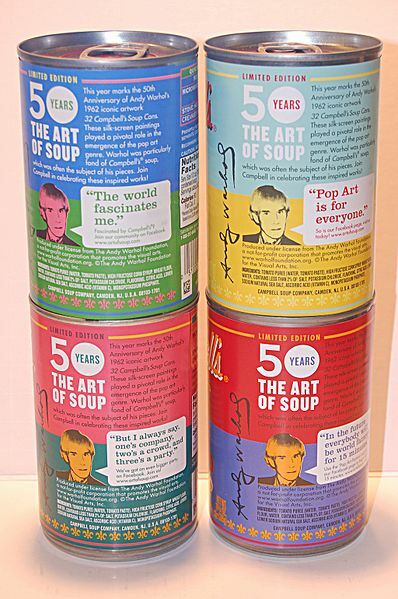 Campbell’s 50th anniversary “Art of Soup” cans feature Andy Warhol picture and quotes on the back. Campbell’s at first had reservations about Warhol’s depictions, but two years later, noting the popularity of his art, Campbell’s marketing manager sent Warhol a letter of appreciation and “a couple of cases of soup.” That same year, Campbell’s commissioned the first of several artworks they would purchase from Warhol over the years. 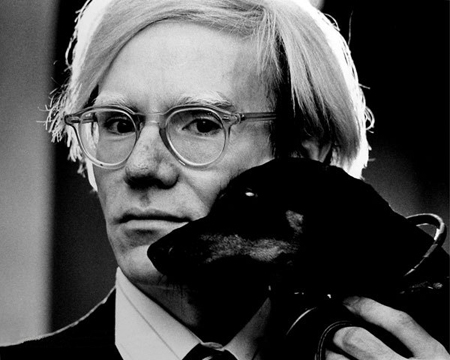 In one of his memorable quotes, Warhol said, “I am deeply superficial.” Much like Marcel Duchamp, one of the thrusts of his work was to raise question the nature of art. The Abstract Expressionists embraced a hard drinking, hard loving, bohemian stance. Willem de Kooning wore paint spattered jeans to his opening at the Museum of Modern Art. He shunned imagery that “the masses” could comprehend, and celebrated the personal signature of his unique, impassioned brush strokes. If Duchamp and Warhol are kindred spirits, there is one great difference between them. When Duchamp hung a urinal in a gallery, he did it for the shock value. By all accounts, Warhol truly loved the icons of popular culture he depicted. He also loved technology and experimented with an Amiga computer shortly before his death in 1987. No doubt he would have been pleased by Campbell’s tribute. The edition of 1.2 million cans that went on sale September 2 for $0.75 appears to be sold out: four can sets are going for $20 – $30 on eBay. This entry was posted in art, Culture, Current Events and tagged 2012, Andy Warhol, art, Campbell's Soup, Culture, current events. Bookmark the permalink. Great quotes, but my favorite is “Art is whatever you can get away with.” I’ll keep that in mind as I write my books.